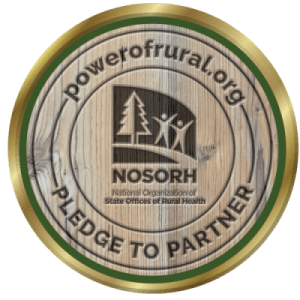 The National Organization of State Offices of Rural Health (NOSORH) is the membership organization of State Offices of Rural Health (SORH). By taking the “Pledge to Partner,” you are helping to transform a single day into a positive movement that strengthens the Power of Rural. As a partner, you are also pledging your support to state stakeholders working on the front lines to bring health innovation, collaboration, and education opportunities to 60% of our Nation’s counties, and to nearly 60 million people, while also helping NOSORH and other partners to advance communication efforts around the key and unique health issues facing rural communities across our great country. Through this forum, we aim to spotlight our Pledge Partners, and over time, develop ways to help establish meaningful connections that are aligned with the Power of Rural mission.